If you are prone to occasional cold sores, there's no reason to be embarrassed. Around 90% of adults have been exposed to herpes simplex (often also called herpes 1 or HSV-1) by the time that they're 50. Between 50 and 80% of the population carries the virus. Herpes complex is thought to have similar statistics. No one knows for sure what causes some people to have more outbreaks than others. 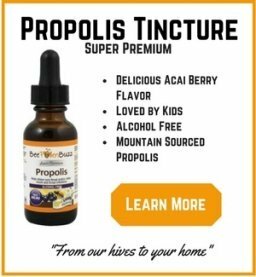 However, recent research is showing that bee products, especially propolis, have the ability to reduce their severity and their frequency. Oral vs Genital Herpes: what's the deal? People tend to overgeneralize when it comes to oral or genital herpes. They tend to think that oral herpes, the one that causes cold sores around the mouth, is only ever herpes 1. By contrast, most people think that you can only get herpes 2 in the genital region. However, either virus can be passed to either location. It's not uncommon for people to display both. Typically, outbreaks are most common in the first year and taper off as your body builds antibodies that can fight the virus. However, for some people, painful lesions can occur without warning and show up with a frequency that makes them frequently uncomfortable. There's no cure for cold sores. Generally, once you have the virus in your body, it will remain there. There are, however, treatments that can help keep the virus dormant. This prevents the inconvenience and discomfort of outbreaks and can also possibly reduce your chances of transmitting the virus through a process known as viral shedding. Keeping the infected area clean and dry can help it heal faster. Prescription medications may also help. And, some of the most promising treatments are associated with natural substances created to keep beehives healthy and functioning. 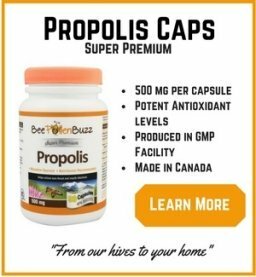 Propolis has a long and well-researched history of providing virus protection. 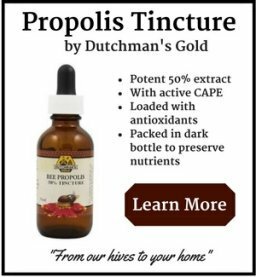 A great deal of evidence shows that propolis can help support the immune system and make viral infections go away more quickly. 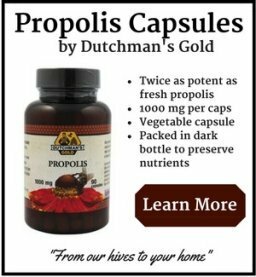 In 2009, research that specifically pitted the power of propolis against the herpes complex virus was tested. In the tests, propolis was used in both water-based and ethanol-based formulas. At the effective level, an application was shown to reduce infectivity by 99%. Additionally, the activity of the viruses was significantly reduced when the propolis solution was added. Royal jelly is another substance that has shown great promise when it comes to battling viral infections. Regular use can reduce your susceptibility and can help you get back to full health more quickly if you are exposed. If the winter season is a time when you are more likely to suffer from outbreaks, applying propolis ointment and consuming a propolis extract can help give you an edge. By taking an active part in your health, you can cut your incidence of cold sores and feel more confident all season long.